Slow cooked roasts are all the rage at the moment. Everyone form Neil Perry to Heston Blumenthal has a recipe for one. Normally it involves either searing the meat before or after the cooking time and cooking the roast at extremely low temperatures (around 70C) for 4-5 hours. This results in a perfect medium rare roast that is pink all the way through to the edges. It is however fiddly with much meat thermometer probing to ensure that the roast doesn’t get beyond 55C. I tried this a few times and, quite frankly found it too time consuming. I recently discovered through food52.com that way back in the 60’s, before the age of celebrity chefs and molecular gastronomy, a New York cookbook author and sometime editor of Gourmet Magazine, called Ann Seranne had come up with an ingenious, and for the time, ground breaking concept. The recipe was posted in a 1966 issue of the New York Times with the simple caption to “Relax”. Finally a rib roast that takes care of itself. Basically you bring the roast to room temperature and preheat your oven to 250C. 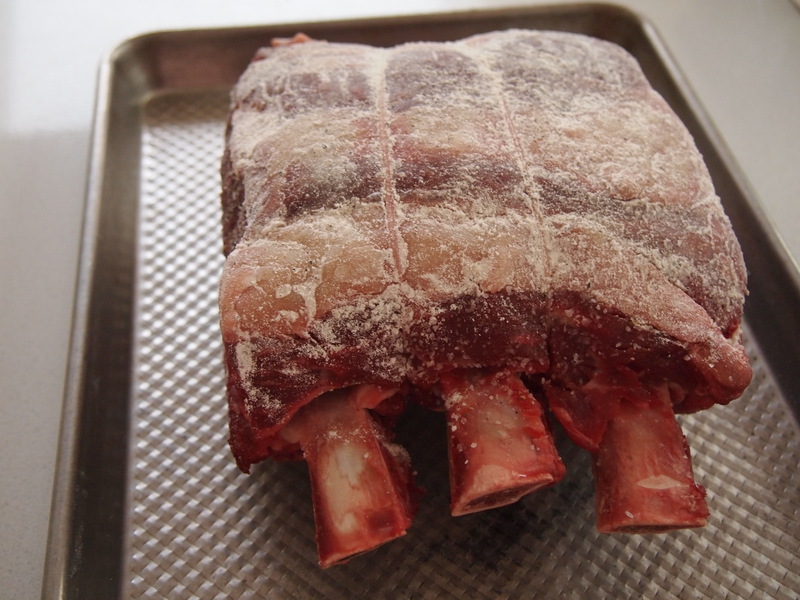 Season the beef with salt and pepper and dust the fat with some flour. Place it in the hot, hot oven for 30 minutes, then turn the oven off and leave it undisturbed – do not open the door – for 2 hours. After this amount of time the roast will be a perfect medium. I must admit that I opened that oven door with some trepidation. I couldn’t believe that it would actually work, and that if it did why anyone would still cook a roast using any other method. But work it did and now my only question is why Ann Seranne isn’t a household name! I used a 3 bone roast that weighed 1.7 kgs (fed 4 people easily) and next time I’ll remove it after 1 1/2 hours as we prefer our roasts medium rare. 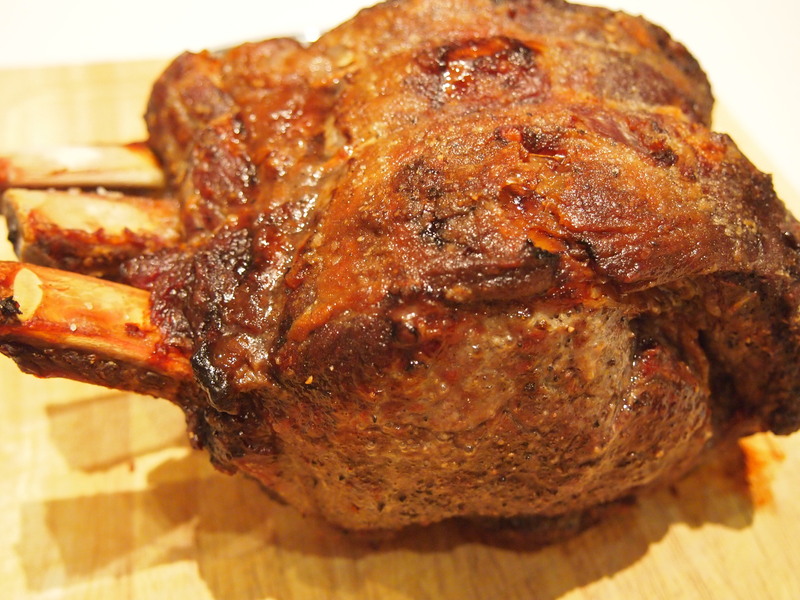 This is just the easiest way to cook a roast and even someone with no cooking skills whatsoever will be able to turn out a prefect rib roast. 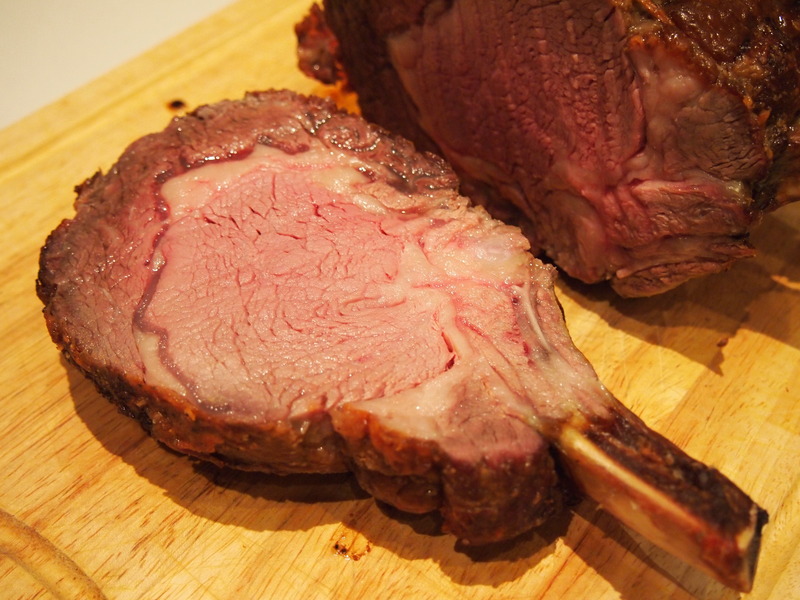 If you’re feeding a crowd and have a very large rib roast I would carve it in 2 to make sure that the cooking times work. I would caution however that this recipe may not work for oven’s that are not well insulated and I would imagine that convection ovens might also prove problematic. I just have a normal modern oven with fan and non fan settings and it worked brilliantly. What would I do if my family does not like to see any pink in the meat? Hi Jennine, I’m only guessing this as I haven’t tested it but I’m pretty sure that if you used a similar size roast you would need to roast it for 35 minutes at 250C and then leave it undisturbed for 2 hours and 15 minutes, maybe 2 hours 30 minutes just to be on the safe side. This should give you a well done roast. Alternatively use a smaller roast say 1.2 kgs and do the same timing as the one on the post. Let me know how it turns out.